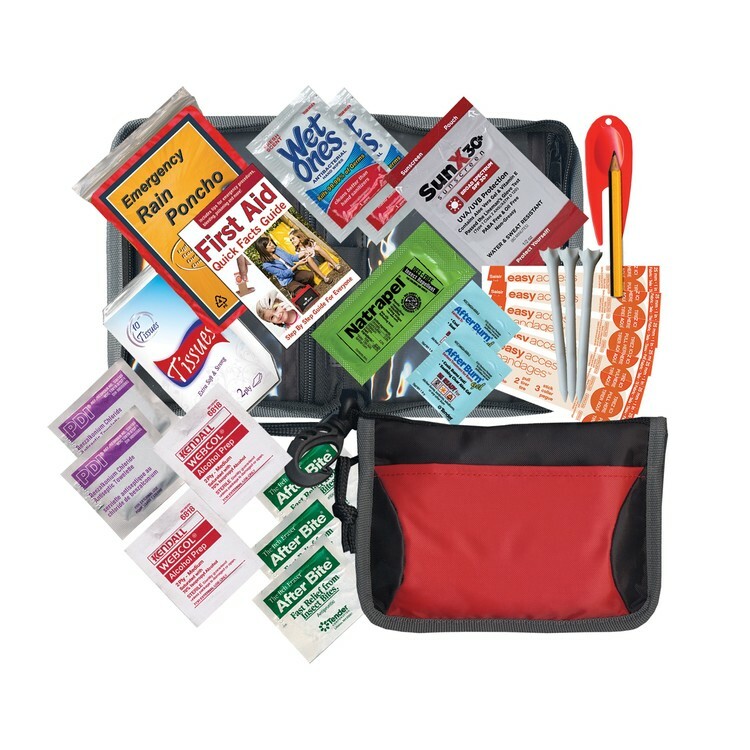 Battle bugs and their bites and put a cap on cuts and scrapes with this outdoor kit. The carabiner and loop make hanging up this kit in your tent or closet a breeze, or it’s small enough to stash in your backpack or glove compartment. 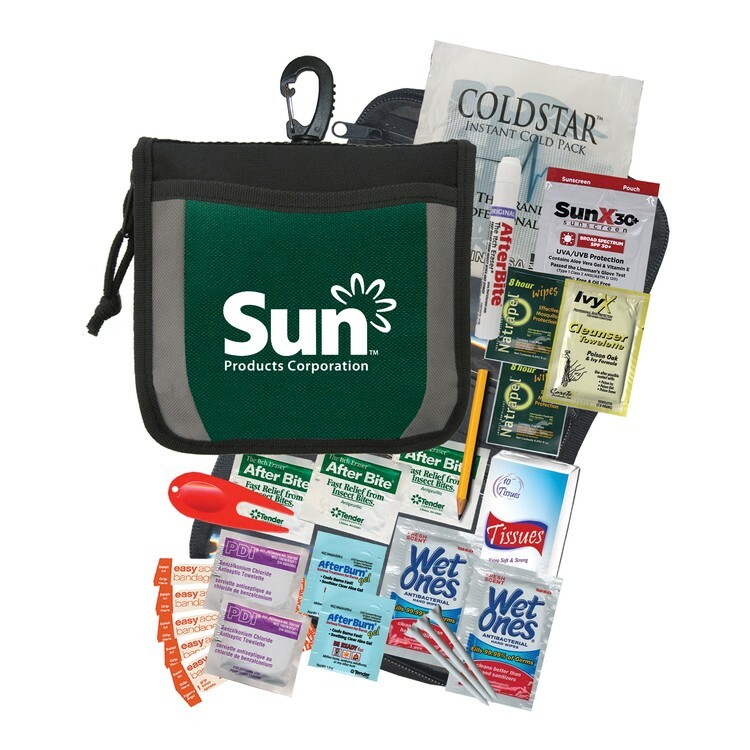 Pick a color and add your organization or corporate logo and create a great giveaway for sporting goods or camping expos or seminars. 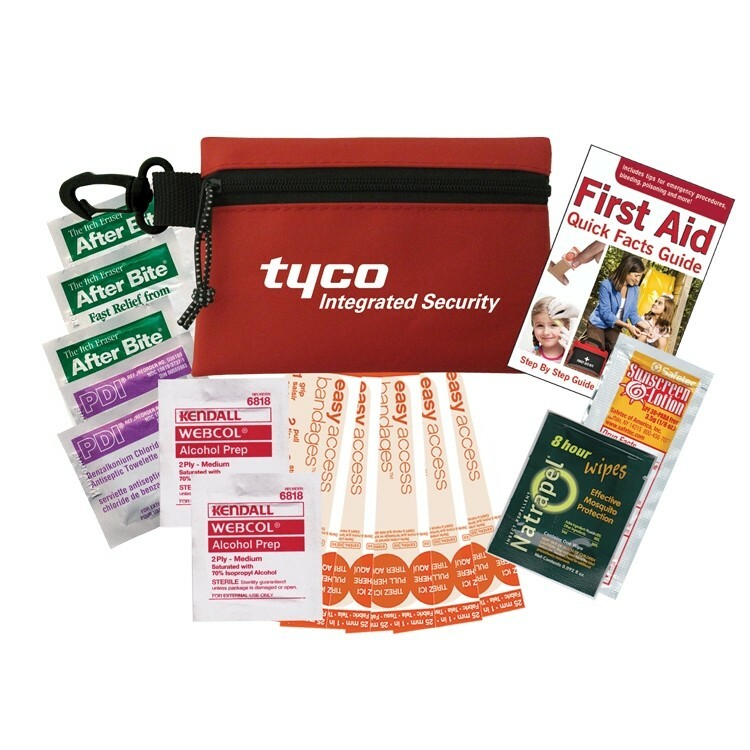 This kit includes 1 Insect Repellent Wipe, 1 Sunscreen Packet, 5 Bandages, 3 After Bite Sting Swabs, 1 First Aid Quick Facts Card, 2 Alcohol Wipes, and 2 Antiseptic Wipes. 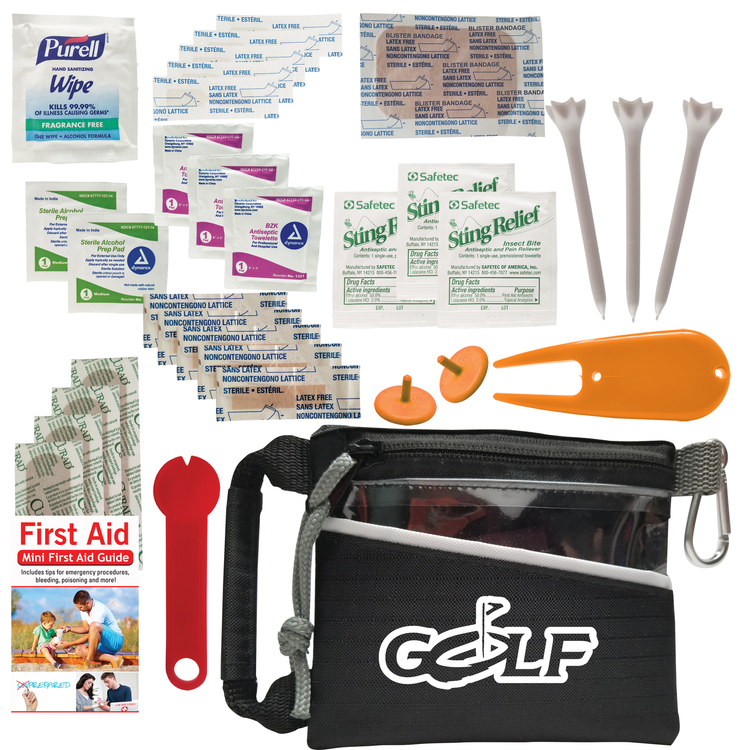 Golf first kit,designed to help you minor physical injuries and other hazards on the course.Kit includes a First Aid mini guide, five bandage strips, three After Bite Itch Erasers, two alcohol wipes, two antiseptic towelettes, three golf tees, one divot tool and two ball markers. Here’s a golf kit that can take all that you can dish out. 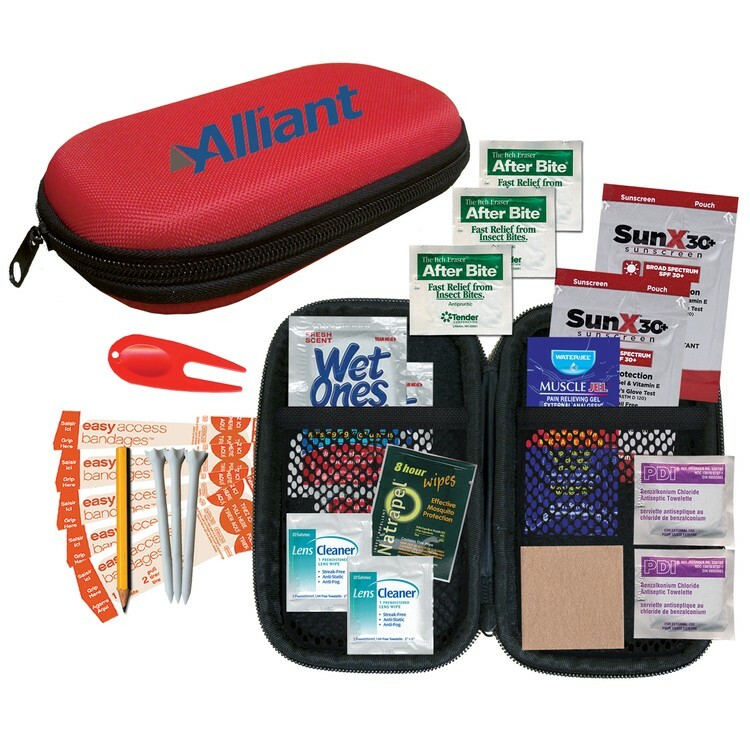 This 7" x 4.5" hard-shell zippered case is made of EVA and contains things you need to sooth your body and improve your golf game. Choose a case color, and add your emblem or message to create a great giveaway for pro shops, corporate golfing events, and other great times on the links. 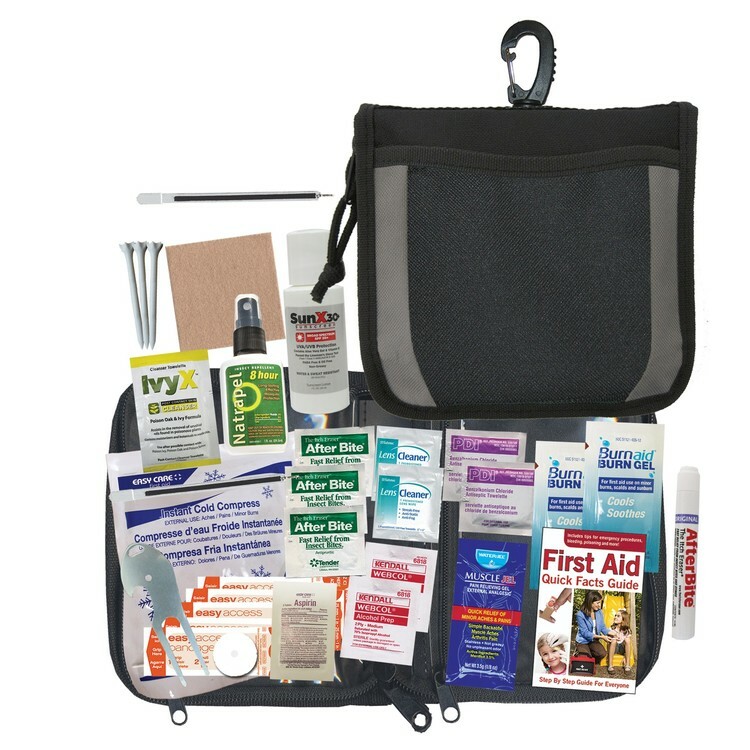 This kit includes 1 Muscle Jel Packet, 1 Moleskin Blister Pad, 2 Premium Sunscreen Packets, 2 Lens Wipes, 1 Insect Repellent Wipe, 2 Wet Ones Wipes, 1 Divot Tool, 1 Pencil, 3 Tees, 5 Bandages, 3 After Bite Sting Swabs, 1 First Aid Quick Facts Card, 2 Alcohol Wipes, and 2 Antiseptic Wipes. 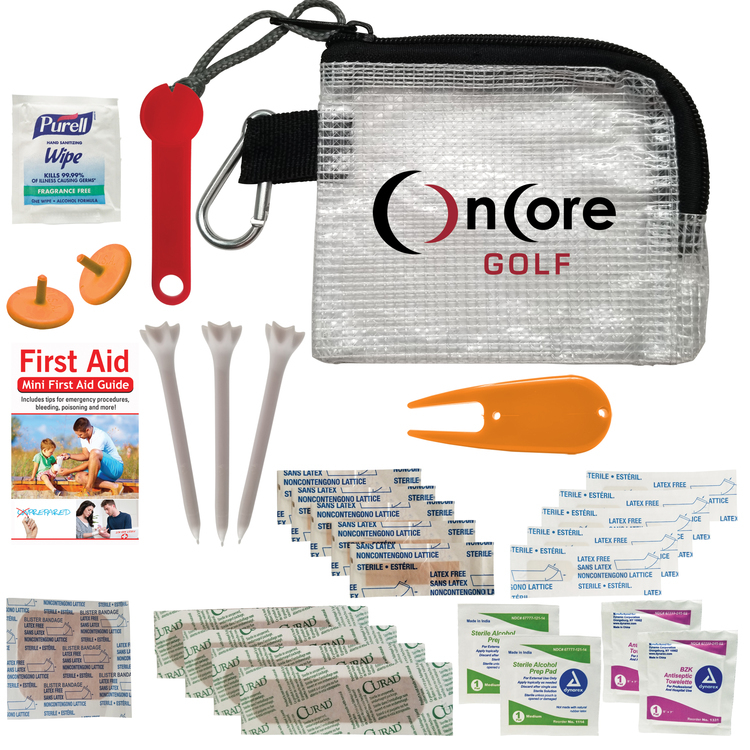 Score a hole-in-one with your customers with this deluxe golf kit. This 6” x 6.5” zippered kit has a rope loop and carabiner clip, so it attaches easily to your golf bag. Choose from four great colors for this case, and add your organization or corporate logo or message to create a great giveaway for a pro shop or a business golf outing. 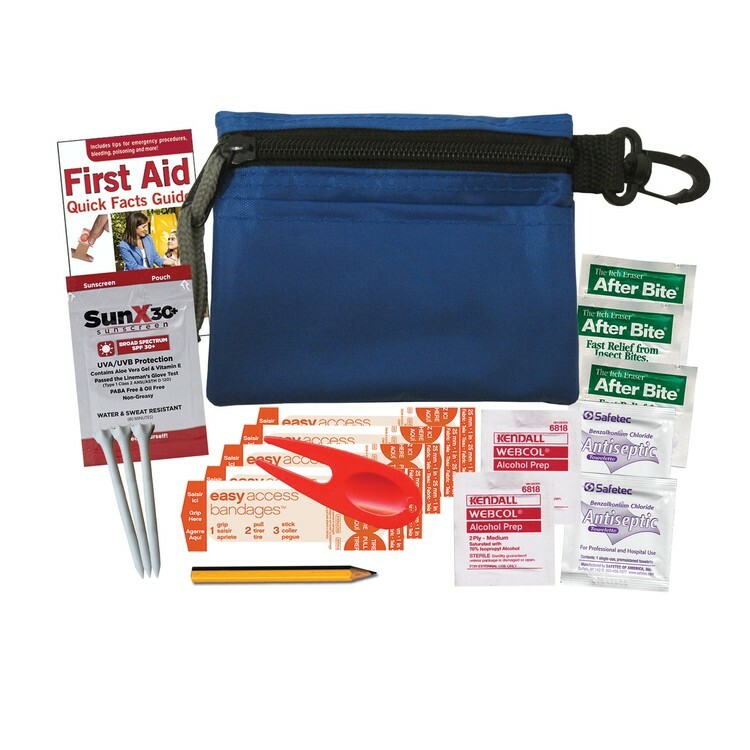 This kit includes 1 After Bite Sting Stick, 1 Ivy-X Packet, 2 After Burn Packets, 1 Ice Pack, 1 Premium Sunscreen Packet, 1 Tissue Pack, 2 Lens Wipes, 1 Insect Repellent Wipe, 2 Wet Ones Wipes, 1 Divot Tool, 1 Pencil, 3 Tees, 5 Bandages, 3 After Bite Sting Swabs, 1 First Aid Quick Facts Card, 2 Alcohol Wipes, and 2 Antiseptic Wipes. 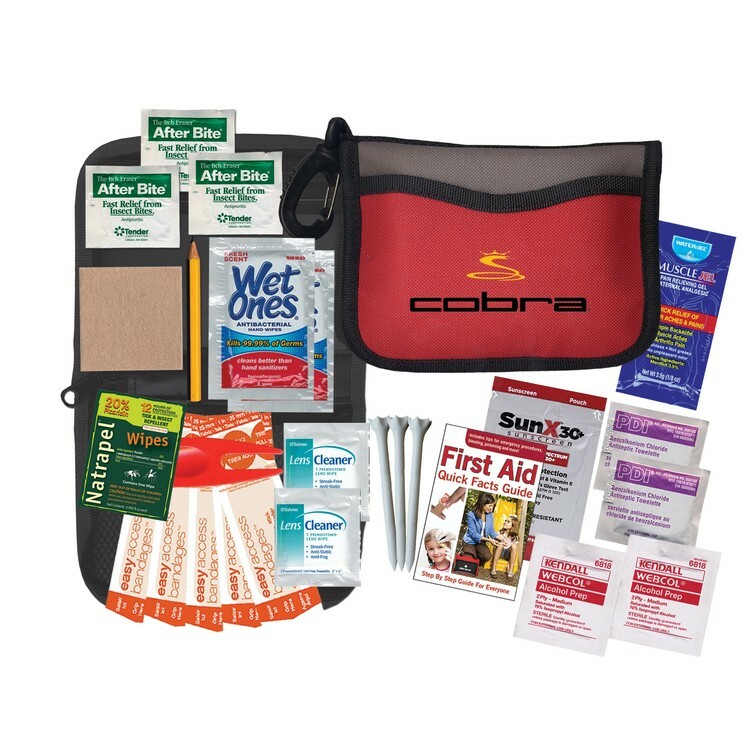 Put a ban on bug bites and exposure, and gas up your golf game with this easy to carry golf kit. 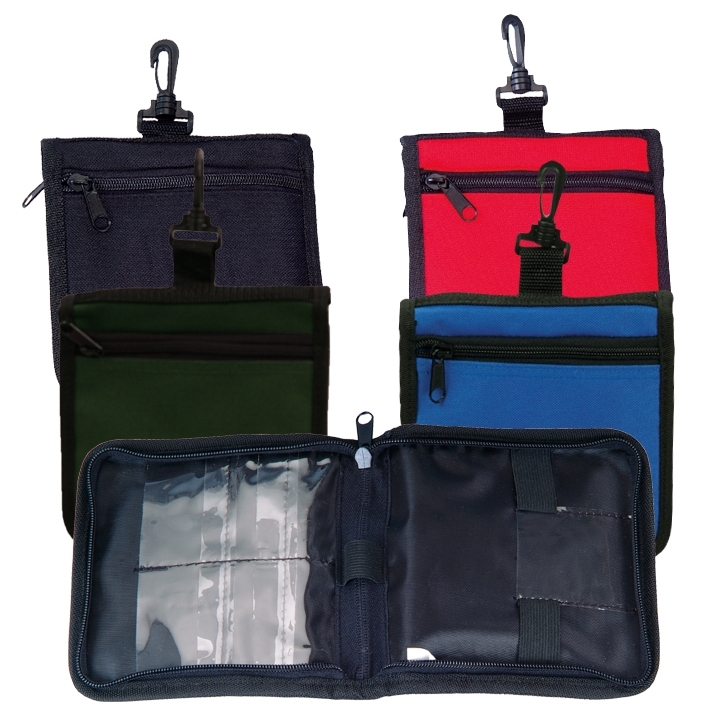 This rugged 5" x 4" zippered nylon case has a rope loop and carabiner clip so it easily attaches to your golf bag. 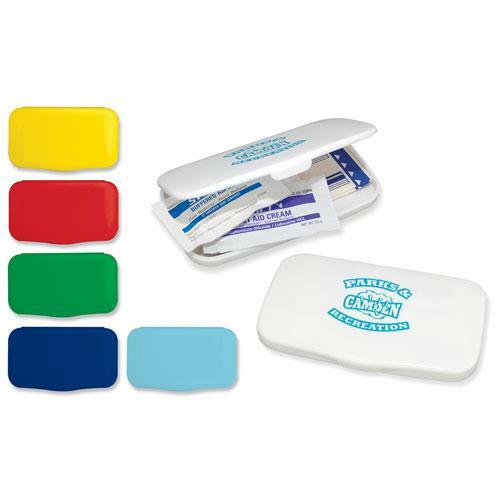 Choose from six great colors for the case, and add your organizational or corporate emblem or message to create a great giveaway for pro shops, corporate golfing events, and other great times on the links. 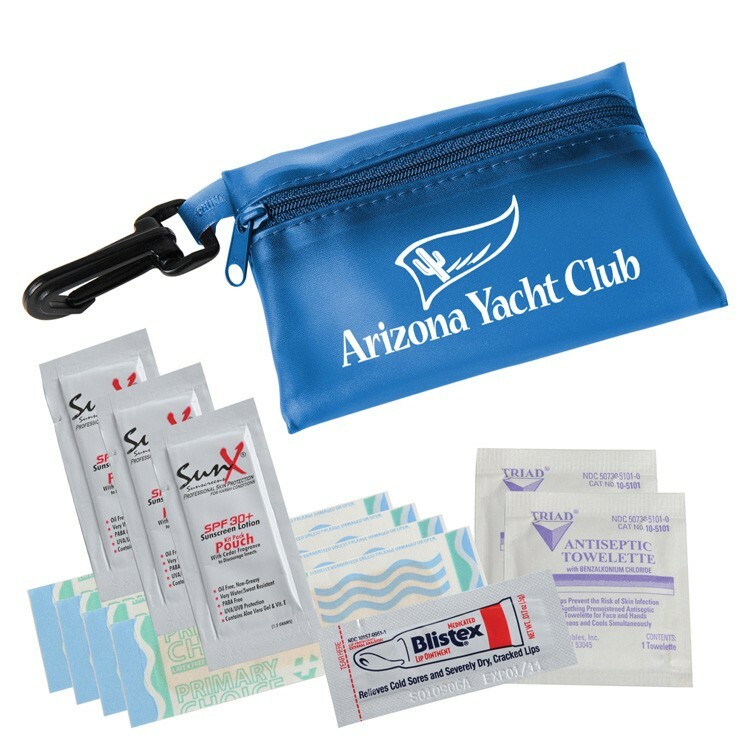 This kit includes 1 Premium Sunscreen Packet, 1 Divot Tool, 1 Pencil, 3 Tees, 5 Bandages, 3 After Bite Sting Swabs, 1 First Aid Quick Facts Card, 2 Alcohol Wipes, and 2 Antiseptic Wipes. Make it all the way to the pin with this great golf kit. 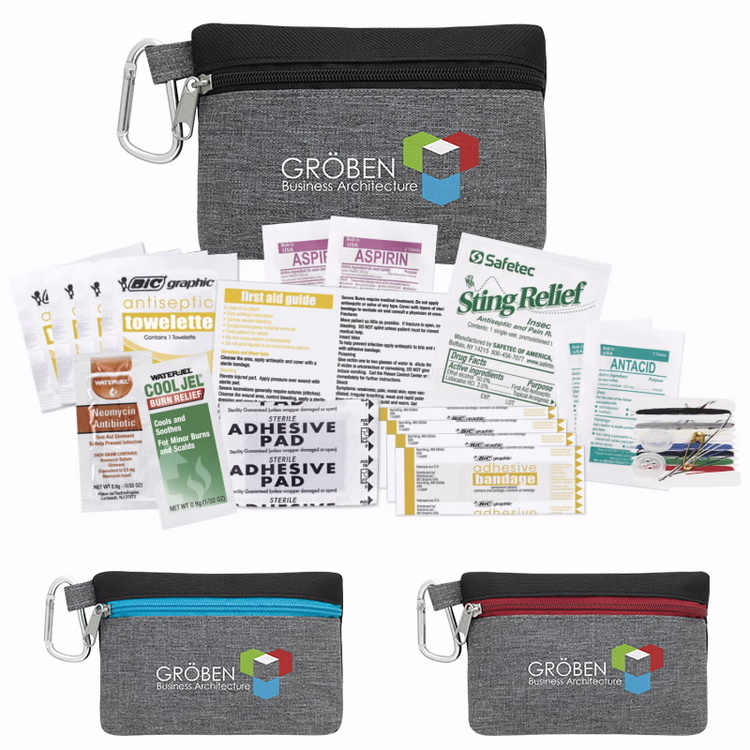 Inside of this 7.5" x 5" zippered nylon case with rope loop and carabiner clip you’ll find lots of ways to up your game and relieve aches and pains. Choose from black, red or blue for the case, and add your organizational or corporate emblem to create a promotion that’s perfect for golf courses, pro shops, and other golf-associated events. 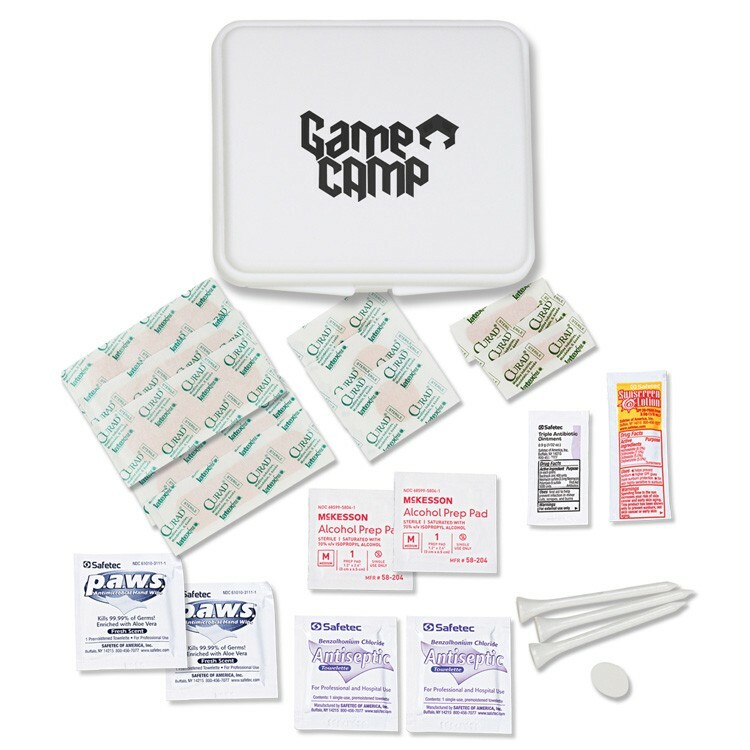 This kit includes 1 Muscle Jel Packet, 1 Moleskin Blister Pad, 1 Premium Sunscreen Packet, 2 Lens Wipes, 1 Divot Tool, 1 Pencil, 3 Tees, 5 Bandages, 3 After Bite Sting Swabs, 1 First Aid Quick Facts Card, 2 Alcohol Wipes, and 2 Antiseptic Wipes. Just grab & go. Gold with confidence knowing that you have everything you need to keep your game on track. 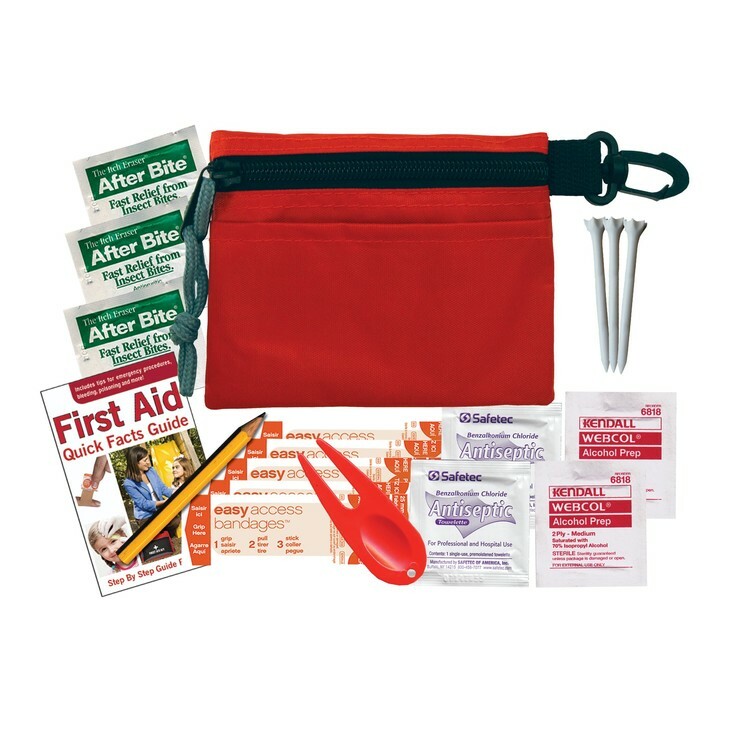 It includes: 1 Blister Bandage 1.5" x 1.5", 2 Ball Markers, 1 Golf Divot Tool, 1 Golf Pencil, 3 Golf Tees Performance, 2 Sting Swabs , 1 First Aid Basics Guide , 4 Flex-Fit Bandages 3/4" x 3" , 5 Junior Bandages 3/8" x 1.5", 5 Butterfly Bandages , 1 Purell Anti-Bacterial Wipe, 3 BZK Antiseptic Wipes, 2 Alcohol Prep Pads. 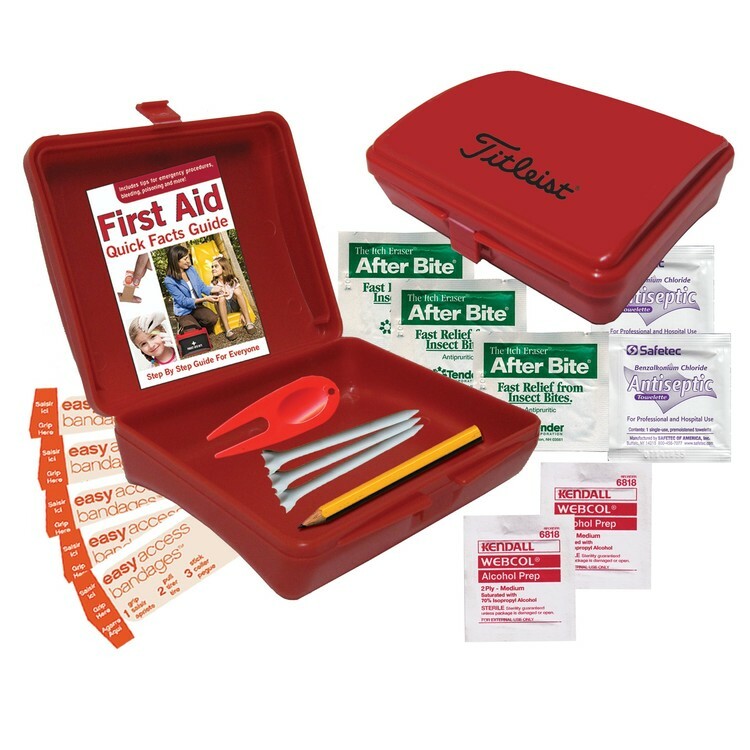 Enjoy a morning or afternoon out on the course without going back to take care of minor scrapes with this golf kit. 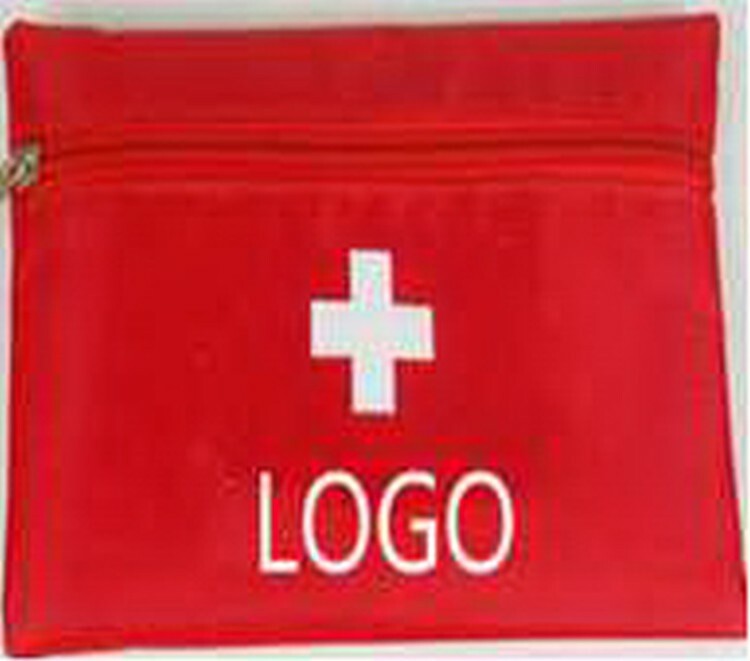 This compact 5" x 4" zippered nylon case has a rope loop and carabiner clip that attaches easily to your belt or golf bag. Choose from six great colors for the case, and add your organizational or corporate emblem or message to create a great giveaway for pro shops, corporate golfing events, and other great times on the links. 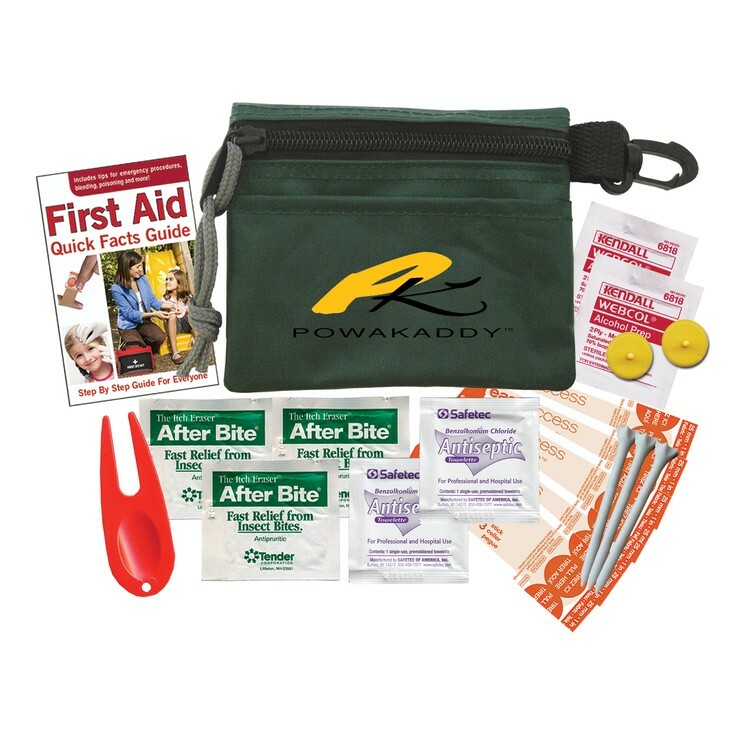 This kit includes 2 Ball Markers, 1 Divot Tool, 3 Tees, 5 Bandages, 3 After Bite Sting Swabs, 1 First Aid Quick Facts Card, 2 Alcohol Wipes, and 2 Antiseptic Wipes. 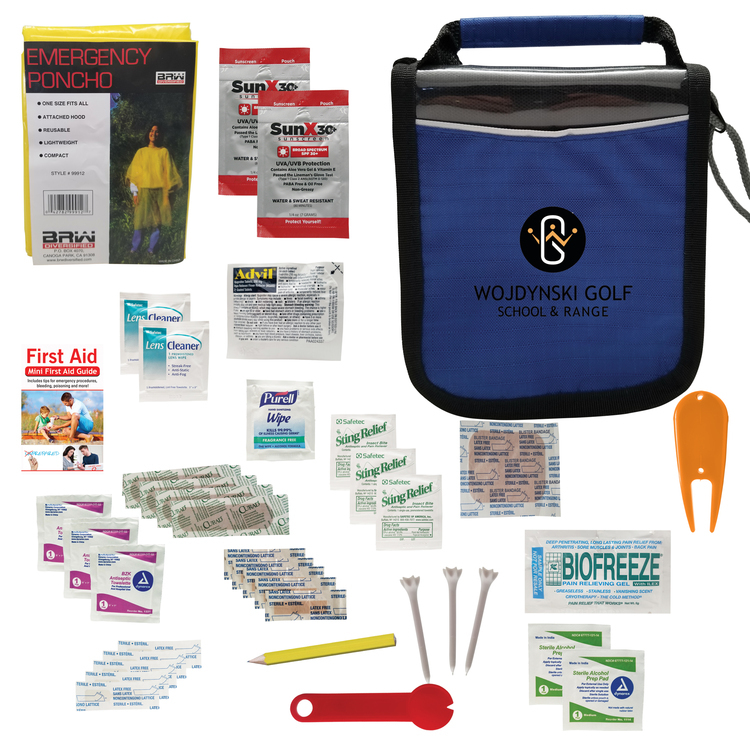 Let your customers and supporters hit the links prepared for any event with this handy and cost-effective golf kit. This colorful package comes in red, black, and royal blue. 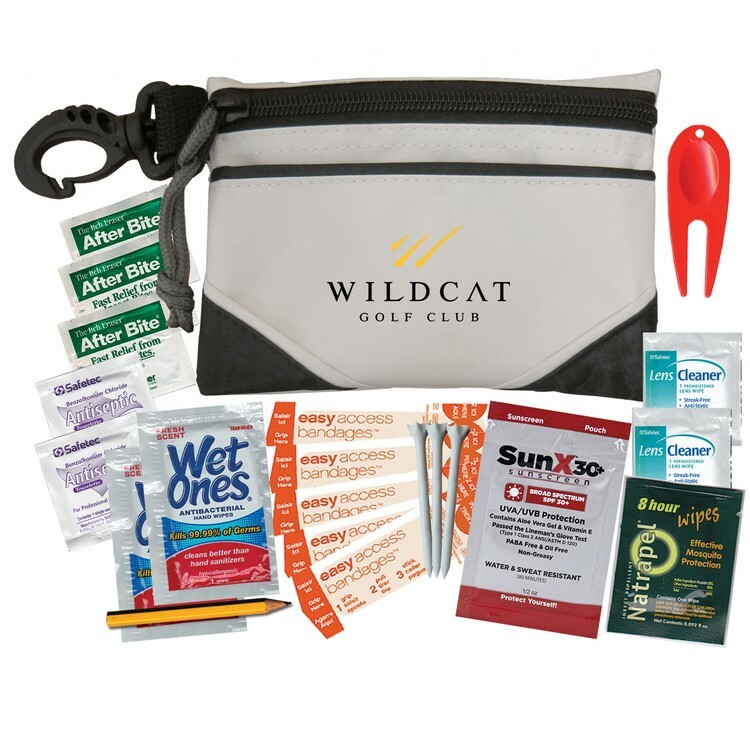 Just add your school, team, club, charity, organization or corporate emblem or message to craft a branded promotion that’s sure to land close to the pin. 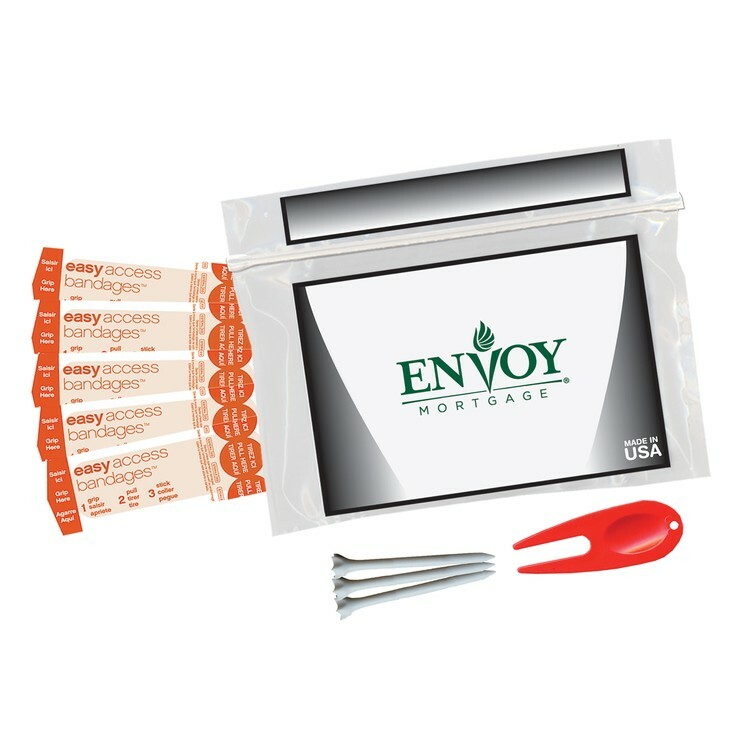 This kit includes 5 Bandages, 3 Tees, and 1 Divot Tool. 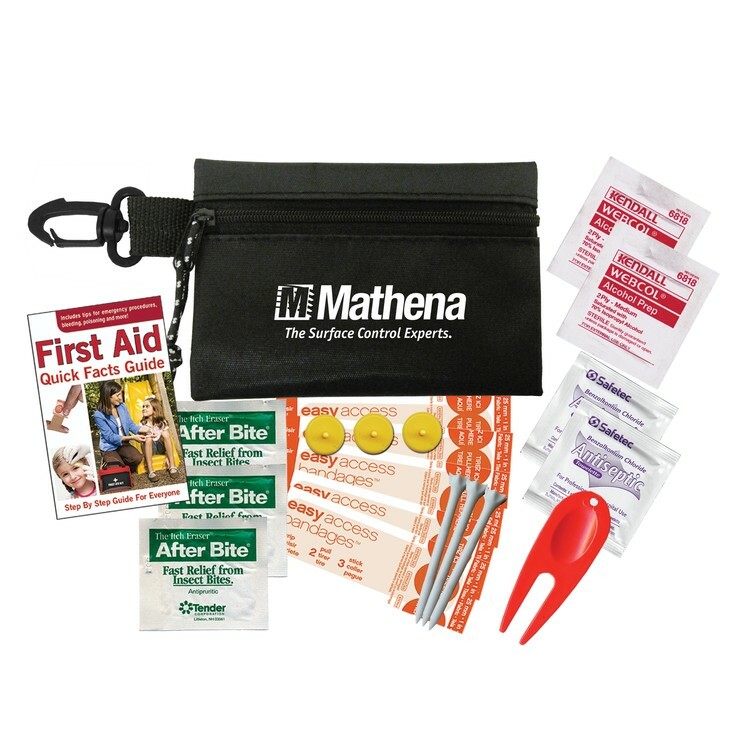 This compact kit packs a punch with a perfect assortment of components for any outdoor event, all neatly contained in a stylish zipper pouch. The convenient carabiner allows you to clip the kit to any golf bag, backpack or other bag. 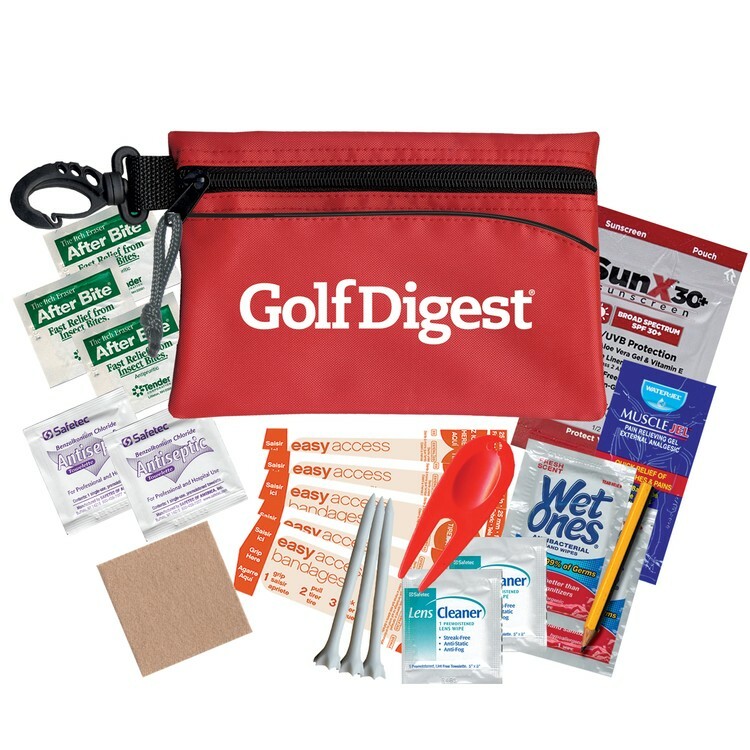 If you have this golfers kit on hand it will ensure despite what hazards may occur that you can deal with almost anything: 1 Blister Bandage 1.5" x 1.5", 1 Rain Poncho One size Fits All, 1 Muscle Jel Rub , 1 Advil Pain Reliever, 2 Premium Sunscreen Packet, 1 Golf Divot Tool,1 Golf Pencil, 3 Golf Tees Performance, 2 Lens Wipes, 3 Sting Swabs , 1 First Aid Basics Guide , 4 Flex-Fit Bandages 3/4" x 3" , 5 Junior Bandages 3/8" x 1.5", 5 Butterfly Bandages, 1 Purell Anti-Bacterial Wipe and more. This handsome deluxe golf kit has everything you need to improve your game and take care of what the elements throw your way. This 6" x 6.5” nylon case features a rope loop and oversized carabiner clip to hang right from your golf bag. Choose a case color and add your logo or emblem to create a great pro shop or giveaway for a corporate golf outing. 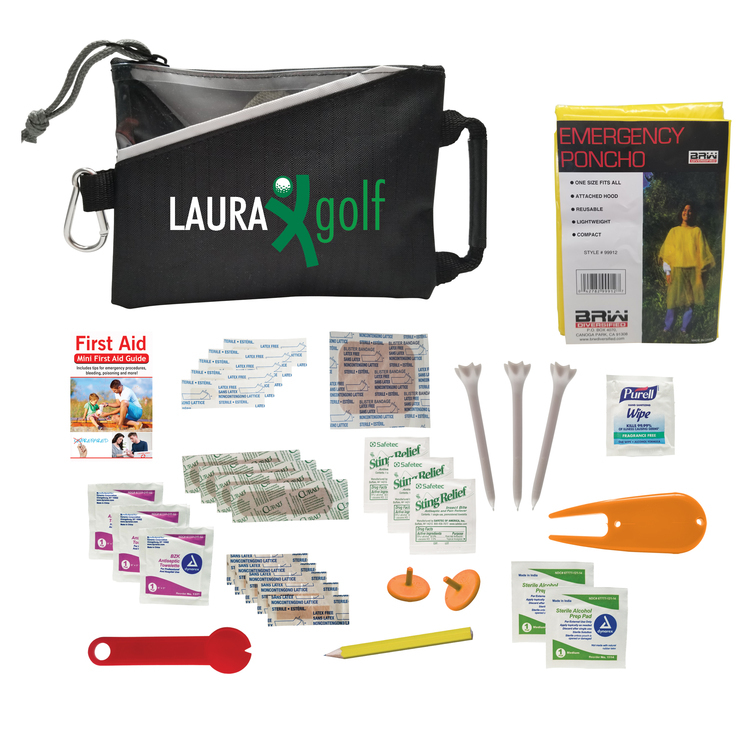 This kit includes 1 Premium Divot Tool, 3 Tees, 1 4" Flexi Pen, 1 After Bite® Sting Stick, 1 Insect Repellent Spray, 1 Premium Sunscreen Bottle, 1 Muscle Jel Packet, 1 Moleskin Blister Pad, 2 Lens Wipes, 1 Aspirin Packet, 1 Ivy-X Packet, 2 After Burn® Packets, 1 Ice Pack, 5 Bandages, 3 After Bite® Sting Swabs, 1 First Aid Quick Facts Card, 2 Alcohol Wipes, and 2 Antiseptic Wipes. Make it all the way to the green with this great golf kit. 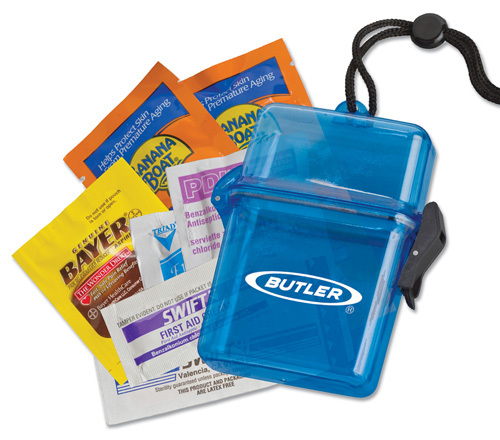 Inside of this 6" x 4.25" zippered nylon case with rope loop and carabiner clip you’ll find lots of ways to up your game and relieve aches and pains. Choose from black, red, blue or white for the case, and add your organizational or corporate emblem to create a promotion that’s perfect for golf courses, pro shops, and other golf-associated events. 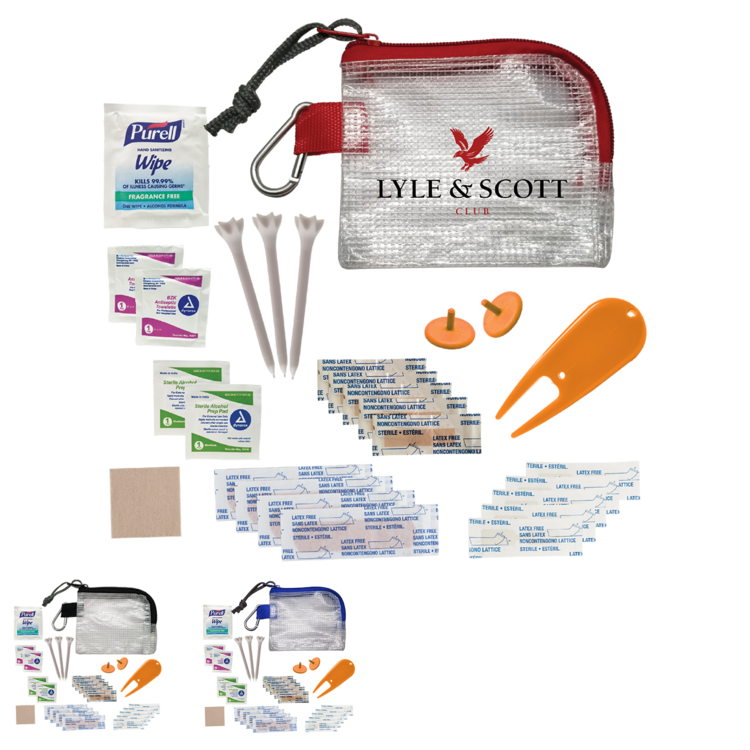 This kit includes 1 Insect Repellent Wipe, 1 Premium Sunscreen Packet, 2 Lens Wipes, 1 Divot Tool, 1 Pencil, 3 Tees, 5 Bandages, 3 After Bite® Sting Swabs, 1 First Aid Quick Facts Card, 2 Alcohol Wipes, and 2 Antiseptic Wipes.